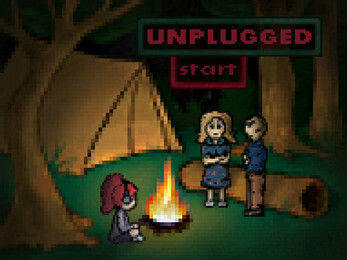 Escape from your parents' awful, video game-free camping trip! Evade hungry woodland creatures and your parents themselves as you make your way to an internet cafe so you can play your games in peace. Video games (and the internet) are SERIOUS BUSINESS. Enemies have a radius in which they can detect you. This will show up on screen. If you are detected you will be bounced to the beginning of the room and lose a life. You have three lives until game over. Wolves run very quickly and will check bushes at random. Don't stay in a bush for too long! Bears will stand still and have a very large range of detection, but it will disable every few seconds, offering you a chance to escape. When you hide behind lime-colored shrubs, enemies will not see you. When you walk inside dark-green bushes, enemies will also not see you. Your parents will be your final obstacle! They will move very quickly and in complicated paths, so be careful! Press Shift to sprint. You will run faster, but enemies will increase their detection radii while you are sprinting!